Windows Live Photo Gallery, a photo by cgancos on Flickr. I thought this was pretty cool. 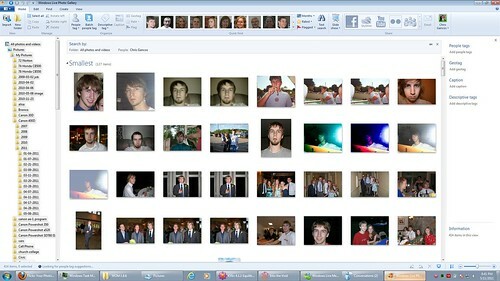 The newest version of Windows Live Photo Gallery has face recognition built in. Like voice recognition software, the more you use it, the better it becomes about recognizing people. The tags are embedded in the photo itself, so if the file is transferred to another computer, the tag will stick. Also, when a tagged photo is uploaded to a site like Facebook, it auto-tags the people so that you don’t have to do it twice. Another cool feature is that it allows you to select multiple people to show photos that contain these people together. This entry was posted on Wednesday, May 11th, 2011 at 8:49 pm	and is filed under Uncategorized. You can follow any responses to this entry through the RSS 2.0 feed. Both comments and pings are currently closed.